So are Savannahs hypoallergenic? This is a question that I get often. There are some breeders that claim that the breed is hypoallergenic. In terms of what the actual definition of hypoallergenic is I could agree that Savannahs are hypoallergenic. 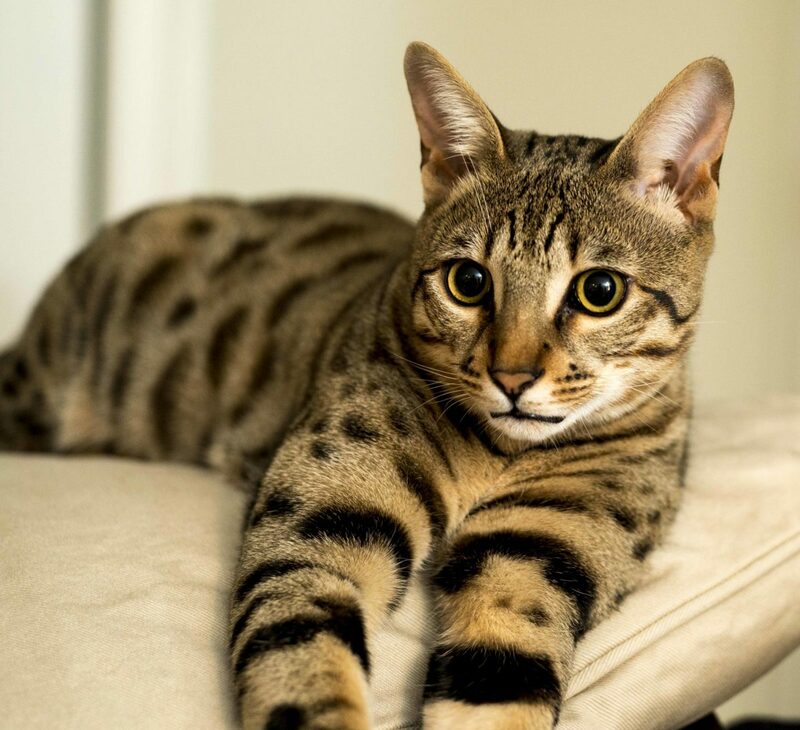 However, I believe that most people seeking the answer to this question interpret the definition as meaning that they will not have any allergic reaction to Savannah cats. This is not always the case, as some people are still highly affected by the Savannahs. What is it that people are allergic to? There are a number of contributing factors towards cat allergies. There is the fur/hair, skin cells, saliva and urine, all of which contain a specific protein, Fel d 1. It is this protein that some people are allergic. Research says that all cats have this protein so any being completely hypoallergenic is not possible. In regard to a typical domestic cat we know that there are varying degrees with which people are allergic. Some people may have a minor watery eye or sniffle after rubbing their face all over a cat while the next person will puff up like a cabbage patch doll minutes after walking into a home where a cat resides. The same goes for the Savannahs, some people have very minor or no reaction to the Savannahs, while others experience the same reaction that they do to a typical domestic. My brother-in-law is a good example of this. He is very allergic to cats and when he visits my parents, who have two F3 Savannahs, he starts to develop running eyes/nose, itching and a scratchy throat within an hour. On the flip side, I have had people with cat allergies visit and intentionally rub a Savannah kitten all over their face in order to solicit a reaction and have not had one. Unfortunately, these scenarios make it very difficult for me to guide prospective buyers on the hypoallergenic qualities of the Savannah. Does the Generation of the Savannah Effect its Hypoallergenic Properties? I do believe that the dander/protein in the higher generation Savannahs is somehow different than that of a domestic cat. I can say that in my years of breeding few people react to the F1 and F2 Savannahs. Something to take into consideration if you have cat allergies and are looking to add a Savannah to your family. 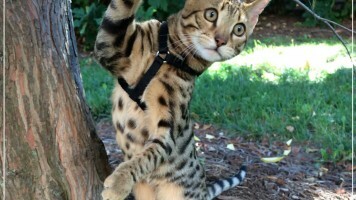 Years ago, there were very few Savannah breeders in existence, making it difficult for prospective owners to make a visit to interact with kittens in person. However, there are now many breeders in each state so the possibility of making a day trip to visit a breeder and see if there is an allergic reaction is the responsible thing to do. There are plenty of people coexisting with pets that have allergies. Some things that have proven beneficial include pet hygiene and good housekeeping practices. Much of the allergy reaction is caused from the saliva that has dried on the cat’s coat from self-grooming. Wet wiping the cat daily to remove the dried saliva greatly reduces allergic reactions, as does brushing the cat to remove shedding hair that would otherwise be deposited around the home. Vacuuming furniture is the other game changer. We regularly vacuum our carpets and sweep, but we vacuum our furniture much less often. Cats are known to camp out on the furniture so there is no question that there will be a build up of danders left behind. One step further for those with more bothersome allergies is to keep bedroom doors closed to ensure the cat is not spreading danders onto bedding and pillows that will come into contact with the face. Looking for further reading on cat allergies? Check out this page from PetMD. Interested in seeing some adorable Savannah kittens currently available? Check out THIS page. I am very allergic to cats. A feral domestic that I adopted has to live outside based on my sniffling, itching eyes and throat around her even for short intervals. Based on those reactions I bought a F5 Savannah who sleeps with me, and I don’t experience any allergic symptoms. I lucked out, but it’s best to hang around the selected litter first as this breeder notes. Also, I find all of the information on this site to be logical and helpful. I’m so glad to hear that you are able to share your home with a Savannah without allergy issues! That is great to hear.